This book... such an emotional read! It has all the feels and I thoroughly enjoyed it! I was blown away with this debut novel by Wade Anderson, and I believe that this book by the husband and wife duo is only just beginning! Lilliana Anderson has been an author that I've been meaning to try for a long time, and when I got an email about an upcoming book that she wrote with her husband Wade, I jumped on the chance to read it. And these two are fellow Aussie's, so of course I'm going to read it! 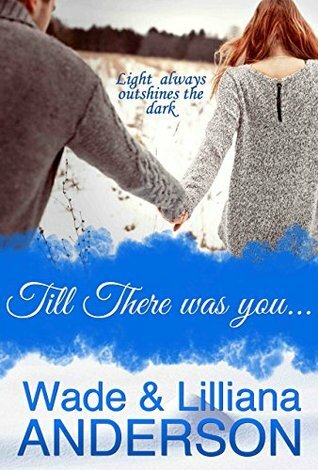 Till There Was You was a heartbreaking but beautiful read as I got to know both Lily and Linc; Lily the owner of a small town bar, and Linc, the quiet Aussie guy that ventured to town occasionally. When there was a disturbance in the bar, Linc stepped up to help Lily out. They continued to cross paths, despite Linc continually pushing Lily away, but their connection grew each time they were together. I could tell that Linc's story was going to crush me, and I cannot imagine ever have to dealing with that. Pieces were revealed throughout the story, but when it was all laid out, it brought a tear to the eye. Lily also suffered loss throughout her life, but she has always had her one constant in her life to pull her throug: her brother Matt. But I knew both of these broken souls were able to heal once they were together. I enjoyed how the relationship built between Lily and Linc and that Lily was willing to fight for what she wanted: Linc. The sexual chemistry between these two was thick, so when they finally hit the sheets, it was explosive! It was also sweet to see that Linc had a K9 companion to help him through everything and in the end he made a friend because of him. This was a great debut novel by Wade Anderson, and I am kicking myself that I haven't picked up anything by Lilliana before. Although I don't usually read books from the third person point of view, I really liked this one because it switched perspectives and I was able to understand what both characters were thinking. It was great to get a change of scenery, and head into Canada! And the epilogue!! It made me so happy! If you are looking for a romance that will leave you happy, you need to pick this one up! This was a big moment for Linc... admitting what he wanted! As his eyes moved between her mouth and her eyes, and his mind took in the feeling of her in his arms, he knew this was right. Being with her felt right. Did you know that you can create short links with AdFly and make money for every visit to your shortened links.